It’s so important to know how and why the plants in the remedies work so well for people. That gives so much more info than “this herb is good for this malady.” It gives structure to the remedy. It helps to show what herbs will work well together and the best menstrua to extract and preserve the constituents. We know they work, but when we can give the science behind it, it brings greater understanding of how the plants are working the body and allows for tools to talk about herbal medicine with those who might be skeptical. On that note, here’s my favorite recipe for Fiery Fire Cider. Scroll down to learn about a few of the constituents in the ingredients that give the fire cider it’s virus killing punch! Mince all ingredients as tiny as possible. A food processor can be used. The smaller the bits, the stronger the medicine! I don’t peel anything as the whole shebang will be strained out. Fill a jar 3/4s full, then fill the the brim with apple cider vinegar. I use unpasteurized, organic and raw. I’m starting with the nutrition of the apple! Tighten a plastic lid or use a few layers of parchment paper between the cider vinegar and metal lid. Consider changing the parchment paper once a week. Let sit for 3 weeks to a month, then strain and enjoy! 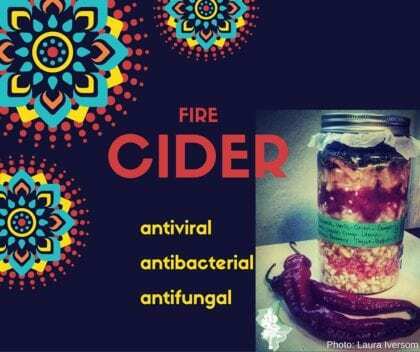 Fiery Fire Cider can be used when those around you are dropping with infections, when the little tickle or headache starts, or just because it tastes so dang good! Consider using it as a marinade and as a base for a dipping or grilling sauce. Heat is what our immune system does naturally at the outbreak of an infection. We call that heat a fever. Fevers happen for this reason: viruses and some live bacteria can’t live at high temperatures. Aren’t our bodies amazing? Our immune system knows what’s up. Fiery Fire Cider gives heat in spades! Onions and garlic contain acetic acid, which is both antibacterial and expectorant, and anthocyanins, both antiviral and anti-inflammatory, giving these herbs the ability to double team bacterial and viral infections and symptoms that arise from them. Horseradish contain limonene, both antibacterial and antiviral. This hot-cha-cha root also contains the micronutrients magnesium, potassium, and calcium. These micronutrients, aka electrolytes, return vital minerals to the body that may be missing during times of sickness when folks may not be eating well. While it’s common knowledge that cayenne peppers contain heat producing capsaicin, that they also contain antibacterial ferulic and cinnamic acids is not so well known. Ginger contains gingerol. Close in action to capsaicin, it also helps to check nausea and vomiting. Hey Hey! You’re a master fire cider maker! You might notice that you’ll need to make more over the course of the winter. In fact, all year long, as it goes quickly! It’s so versatile and one of my favorites. Be well and let Fiery Fire Cider become a part of your healthy lifestyle! Big love to you! Hello! I have a quick question about Fire Cider – I made a batch last November, when I first moved into my new house. Because of the move, the jar was forgotten at the back of a cupboard – and stewed there for many months before discovery. I finally opened and ‘decanted’ after about 9 months! It smells fine – but I wanted to ask – would it still be OK? Its sitting in the fridge waiting for use or throwing out. Thank you! Plants left in jars of menstruum. Boy does this ever happen a lot! Depending on the menstruum and plant itself, some are ok left in longer. For instance, I keep my cottonwood buds in honey for three to six months before decanting. Very once in a while, I get a jar that ferments because the cottonwood buds were wetter than I realized. As far as your fire cider is concerned, if you used onions and garlic, they have their own anti-microbial properties. What does the top of the product look like when the jar is opened? Is it black or dark in color? Any evidence of mold? If so, chuck out the whole shebang. If not, then perhaps it is ok! I would definitely decant it, though. I have tried this made fresh but I am very hesitant to consume it after it ‘sets”- no matter if it is decanted. Theoretically can’t someone become really ill from this process? If one sells this (my friend does) would it be not wise to have people refrigerate it and toss in two weeks? Would recommend sterilizing the containers? I use my fire cider up to a year without any issue. You can choose to keep your fire cider in the fridge if that gives you more confidence. If someone chooses to sell it, it must be processed and bottled in a commercial kitchen, and yes, sterilize the containers first when selling.